For the American pairs, this year’s U.S. Nationals has a different feel than other recent national championships. The United States has only 1 pairs slot for the Olympic team this year, instead of its customary 2 slots, which changes the dynamic of the competition. 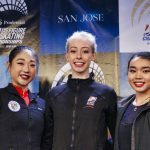 Perhaps as a result, we saw some unexpected results in the pairs short program at U.S. Nationals Thursday afternoon. Alexa Scimeca-Knierim/Chris Knierim won the short program as expected, but their victory didn’t come without a fight. The Knierims started their “Come What May” short program with a terrific, high triple twist, but then had problems on the side-by-side triple Salchow. Chris turned out of the jump, costing them some negative quality, or grade of execution (GOE), marks. Then there was a shaky moment going into the throw triple flip, as Alexa’s heel grazed Chris’s pant leg on the entrance. The audience gasped as Knierim slipped slightly. But Scimeca-Knierim gamely hung on to successfully land the throw. The Knierims closed with a strong lift and death spiral to score 71.10 for 1st place. Despite the miscues, the Knierims were happy with their performance and the result. “Everything is coming together,” said Chris Knierim afterward. “We’re both feeling 100% in training. So we’re just very happy. It’s been a long two years,” he said, referring to Scimeca-Knierim’s recovery from abdominal surgery. Just recently back from a serious knee injury, Tarah Kayne/Danny O’Shea didn’t come to Nationals with a lot of momentum. However, the 2016 National champions turned in a great performance in the short program. They hit solid side-by-side triple Salchows, then landed a good throw triple Salchow out of a difficult choreo lift. Not only that, they connected strongly with the audience, really conveying the emotion in their “All I Ask of You” Phantom of the Opera SP. Kayne/O’Shea earned 68.93 to place 2nd. Kayne/O’Shea feared they might lose the entire season. But fortunately, Kayne was able to return to the ice after a further month and a half of therapy at the Olympic Training Center. 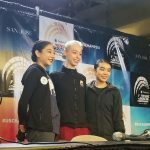 The couple admitted they were very nervous for their first event this season (Golden Spin of Zagreb) and were happy to skate much better here in the short program at Nationals. Deanna Stellato/Nate Bartholomay, also coached by Peterson, returned to their “Hallelujah” SP in San Jose and repeated their success from last year’s Nationals with the program, placing a strong 3rd. Stellato/Bartholomay hit a nice triple twist and very good side-by-side triple toe loops. Their throw triple loop was just a bit forward on the landing, but received no negative GOE. All of Stellato/Bartholomay’s elements were solid; their GOE marks were almost all positive. Their step sequence was particularly good, with strong edges and good speed. Stellato/Bartholomay earned 67.84. It was easily their best short program of the season. Afterward, Stellato/Bartholomay discussed the decision to return to “Hallelujah” after starting the season with a different “Eleanor Rigby” short program. But something didn’t feel right. Coach Jim Peterson, who had suggested earlier that they keep “Hallelujah,” raised the topic again. Stellato/Bartholomay decided to make the switch right after Skate America. Defending national champions Haven Denney/Brandon Frazier placed 4th in the short program due to problems on their side-by-side triple Salchows. Frazier doubled the jump, while Denney had a slight spinout. It was the only error in an otherwise strong program. Denney/Frazier hit a lovely, high triple twist and terrific throw triple loop (both elements received very good GOE marks). Their step sequence was also very nice, smoothly performed and with much of it in hold. Denney/Frazier scored 63.63, about 4 points behind the leading teams. Chelsea Liu/Brian Johnson put out a strong short program in their second senior Nationals. Johnson turned out of their opening side-by-side triple Salchows, but the rest of their elements were well-done. They were the only pair to be credited with a level 4 triple twist, and their throw triple Salchow and star lift earned good GOE. Liu/Johnson scored 62.35 for 5th. Afterward, the couple said they were pleased with the program. Johnson added that they’re focused on connecting with the audience. Defending National silver medalists Marissa Castelli/Mervin Tran had a few technical issues in their short program. Their level 3 triple twist was completed but received some negative GOE, which held down their overall score for the element. Then Castelli fell on their side-by-side triple toe loops, and the jump was downgraded, earning only .70 points. Castelli/Tran’s throw triple Salchow was good. However, their PCS fell a bit behind the top teams. They earned 60.75 for 6th place, and will no doubt be looking to pull up in the long program. Jessica Pfund/Joshua Santillan had their best short program yet at U.S. Nationals to place 7th. They had a low catch on the opening level 2 triple twist, which cost them some negative GOE. However, they made up for that with good marks on their throw triple loop and side-by-side triple Salchows, both of which were nicely done. They also had good coverage on their star lift. It was a very good performance overall for the Florida pair, and they earned 60.52. Last year’s National bronze medalists Ashley Cain/Timothy LeDuc unexpectedly struggled in their short program, placing 8th. The couple looked a bit off in this routine. Their triple twist was only level 1, with negative GOE. Cain put a hand down on the throw 3F, and LeDuc fell on the side-by-side triple loops. However, they did have the highest-scoring step sequence of the afternoon; this sequence allows them to show off their musicality, unison, and strong edges. Cain/LeDuc scored 60.03. New senior team Nica Digerness/Danny Neudecker had a good debut short program. They hit a clean set of double Axels and a fine throw triple toe loop. Their other elements were completed, but not at the highest quality level, receiving scattered negative GOE. They earned 53.78 for 9th. New team Winter Deardorff/Max Settlage rounded out the top 10, earning a score of 51.15. The U.S. pairs will take the ice again on Saturday for the free skate at U.S. Nationals.